A night of heavy drinking is horrible training for mountain climbing. We knew we were going hiking the next day, so the problem was not sipping Guinness in the pub. Or the three locals we met. Or the shots of whiskey we bought each other. But that moment of decision, the moment when the pub is emptying onto the street, and our new friends invite us to a late-night club. The decisive moment when continuing drinking always seems like a good idea. And, well, we were on vacation. So Patrick and I found ourselves wandering the streets of Westport, set on the coast of northwest Ireland, following our new friends through the dark winding streets. Like in all strange places, I ignored the already ample drinks, to concentrate on the route we were taking. We would, at some point, have to find our way back to the hotel. The club was relatively empty when we arrived, with the sunken dance floor shaped like a boat surrounded by railings and the bar. We once again bought each other shots and Guinness, and then stood at the railing, looking down on the empty dance floor. It took some time for people to drink the courage to dance, and then something strange happened. From my limited experience with dance clubs, I seem to remember the women first venturing out onto the floor, standing in circles around their purses, moving quietly to the beat, looking around at the boys watching them, and giggling to each other. But here it was the men, or should I say boys, who ventured out first. They stood in groups, and danced, well, badly. They danced with flaying arms, and exaggerated gestures. They laughed at each other, and pointed, and tried to do horrible moves like the sprinkler, or the moon walk, or even pop-lock stuff. I watched and smiled. Over time, the girls invaded and the boy’s dances became more subdued as they tried to take someone home for the evening. There were more drinks bought, and a few shots were interspersed, and I seem to remember dancing at some point, but the song or who I danced with is a little vague. Actually everything that happened in the dance club was a little vague, until it was time to go home. Stepping from the steamy club, onto to the cold dank March street, I took a deep breath, concentrated my mind, and focused on finding our way back to the hotel. We made it, I have no idea at what time, and slept like the dead. Patrick and I were traveling Ireland for a week. Our plans were a little vague. We ended up where we ended up. 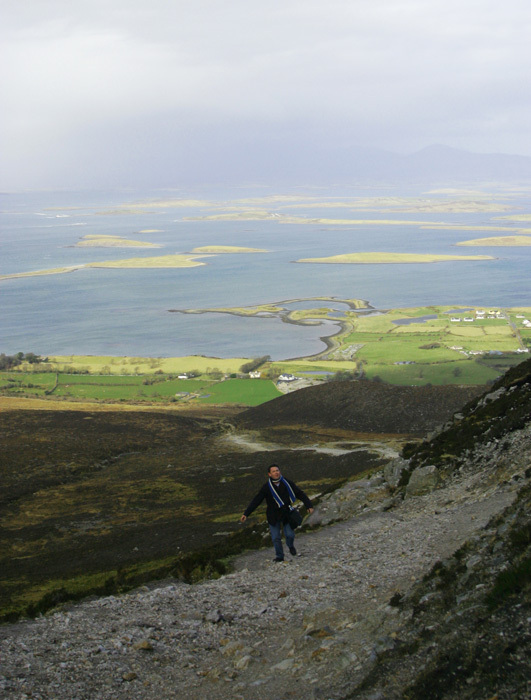 But one of the definites on this trip was climbing Croagh Patrick, which is set on the outskirts of Westport. 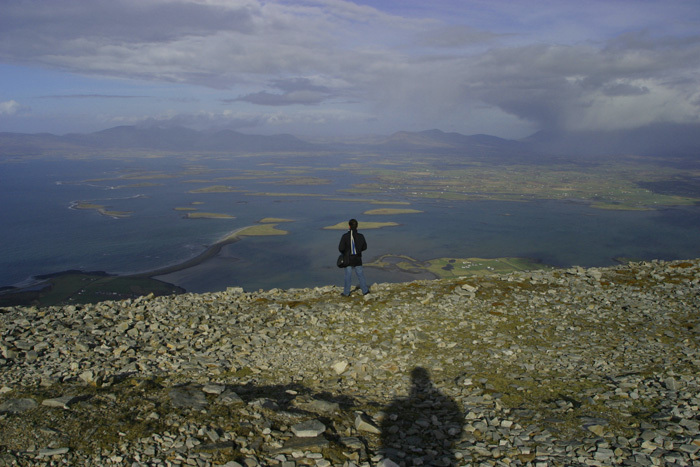 The mountain is a pilgrimage and holy site, where people travel from all over to climb to the top in honor of St. Patrick. He is supposed to have climbed the mountain, fasted for forty days, and then promptly banished the snakes from Ireland. Upon hearing this piece of information, my sarcastic mind jumps in with: but there were no snakes in Ireland in the first place. It’s too cold, and snakes are cold blooded. But then another thought came to me. He became a Saint for banishing something that was already gone. I’m gonna banish Polar Bears from Africa, maybe I will become a saint. We awoke in the early morning feeling better than we should, which meant we were still drunk, checked out of the hotel, and clambered into the car for the short journey to the mountain. At the parking lot, we looked up at the mountain with pale and questioning glances. Despite the rest of Ireland being green, this was a mostly grey slate mountain. The top was smooth, like a dome, so it should be easy to climb. But that was not much condolence as we looked at the 2,500-foot summit, and noticed we were about ten feet above sea level. When we returned from the store, instead of heading directly up the mountain, we crossed the street to the ruins of a church, a large graveyard, and the strangest ship I have ever seen. 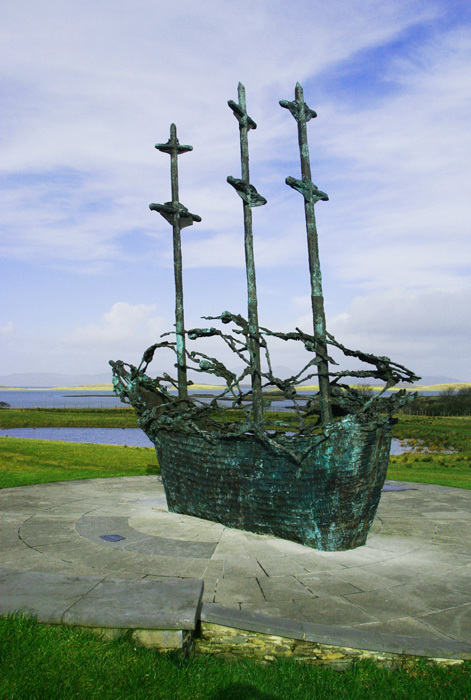 A quarter mile from the sea, set in the middle of a concrete circle, is the statue of a 30-foot ship. It is a three-masted schooner from the 1850’s and made out of what looked like green brass. It was not the ship, but the skeletons that made it strange. The skeletons were flying along the edges of the boat, as if they were angels helping it along. 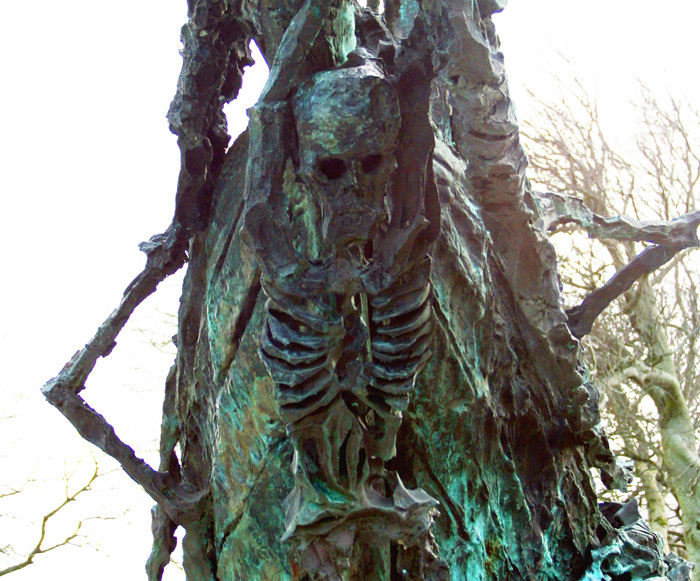 I walked around, staring at the flying skeletons wondering what this was supposed to represent. On the front, where there is usually a beautiful woman baring her breasts, was another skeleton, baring its ribs and empty eyes. 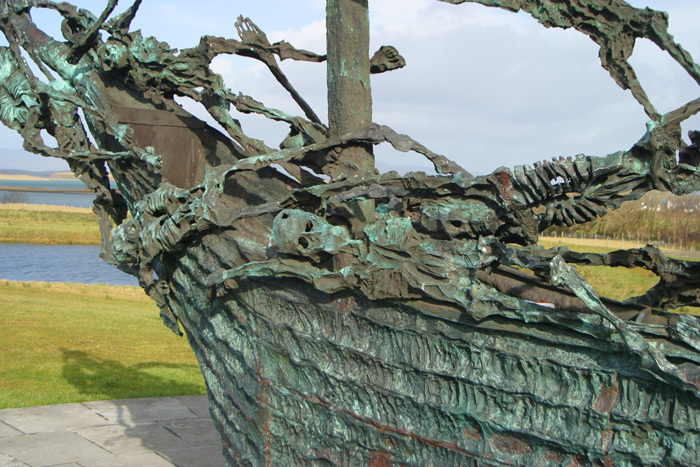 The ship is called the National Famine Monument, or the Coffin Ship. It was dedicated in 1997 for those who died or fled the country in the 1850’s. Before the potato famine the population of Ireland was 8 million. After, it was 4 million. The trip up the mountain began slow and steady. The path is continuously rocky. There is almost no dirt on this mountain, the rain had washed it into the sea thousands of years ago. The rocky path kept our focus on our feet, trying not to twist an ankle. Off to our sides there were a few sheep trying to get nourishment from the sparse grass. Soon the incline increased, as did our wheezing breath. I cursed the cigarettes from last night and, well, also the ones from the ten years previous. The climb continued and continued in a mind numbing, foot plodding, kind of way. Don’t think about the headache, don’t think about the alcohol-fueled sweat. In a while the steps became routine and my mind wandered, wandered to the places we had been, trying to remember who I had danced with the night before, where we were going next, and then about the pub on the top of the hill. There must be some entrepreneurial Irishman who built a pub on the top of this holy mountain. He knew that the pilgrims would be tired and thirsty after the climb, and would love to sit in an easy chair, drink some Guinness, put their feet by the fire and eat a sausage sandwich or two. It can’t be blasphemy for sitting in a pub and reviving yourself for the walk back down. I knew it would be there. I could taste the drink, and the sausage, and the HP sauce, yes the sausages needed HP sauce. It might be a holy place, but I think god would understand. Patrick kept taking breaks from the hike, but I was afraid if I stopped and sat down I wouldn’t get back up. I wanted to get this over with, to just keep moving. I just wanted to be at the top, to sit and drink my Guinness, and maybe a pork pie. So a little more than half way up, Patrick took a rest, and I kept moving, keeping my eyes on the path. Don’t look up, and see how far you have to go. Just keep placing one foot in front of the other. I concentrated on the stones on the path, looking at the seams of rock, and the worn places which were obviously not wind and rain, but millions of pilgrims foot steps. Finally I reached the saddle, between the two peaks. There were small crude round stone huts. None with a roof. They must be centuries old, places for pilgrims that are no longer needed. 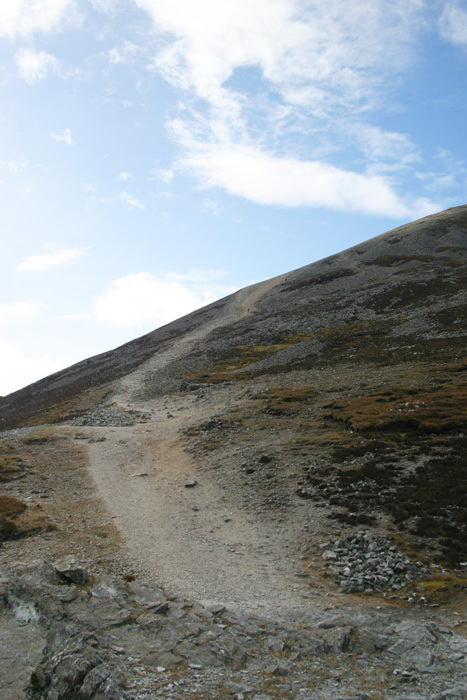 The path suddenly steepened as it reached for the summit. The path dissipated into a hillside of broken slate. The grey rock rested loosely on the ground and shifted and moved with every step. The going took patience and concentration as there was the proverbial two steps forward, one step back. On the good side, the hill was steep enough to be able to place my hands on the ground without leaning forward much. I think some Lamb with that Guinness would be nice. Until, suddenly, I was there, I was standing on the hard stone summit. It was all pale grey rock, with not a tree in sight. And there was my pub, waiting for me. But no, it was just a locked chapel. There was no Guinness, no sausages, no lamb. I knew there was no pub up here, I knew there was no Guinness and no food. But damn it, that doesn’t mean I wasn’t disappointed. But the view was nice. To the north the intermittent while clouds sat above the bay. The bay where ships, 150 years ago, set out for America. The bay; filled with little green islands, blue-grey water, and Westport at its eastern edge. Off to my right, the path lead down the mountain, which I didn’t want to think about now, and the road, and the car, and just down the street from them, a pub. 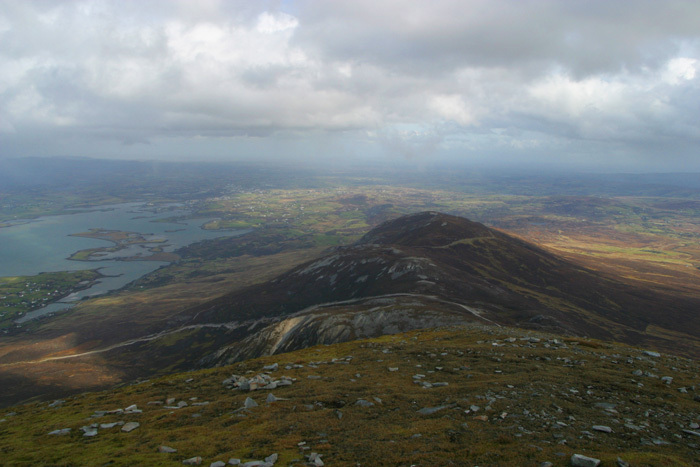 Looking east, with the path up the mountain, and the city of Westport at the end fo the bay. Patrick arrived, faster then I thought, and slumped down next to me. We didn’t say a word for a few minutes. Eventually we discussed building a pub up here. And later, frequented the one at the bottom of the hill. Because, well, we were on vacation. Patrick on top of Crough Patrick.